I posted my envelope of Brussels Squares last week. I didn't manage to tat quite as many as I would have liked but it's still nice to be part of this big international project. I enclosed my wish and hope for women all over the world. I can't wait to see the finished article in situ! Thank you for your comments as always. I carried on with the top left design from the previous post in the end. As Muskaan said, the one without centre may not have been sturdy enough, the extra centre ring adding a lot of stability to the design. There are many patterns available already for these little 3x3 cm squares, they can be found on the "Let's Tat a Brussels Monument in Pink for Women's Rights" Facebook page is you're interested. I'm adding mine if anyone fancies it. 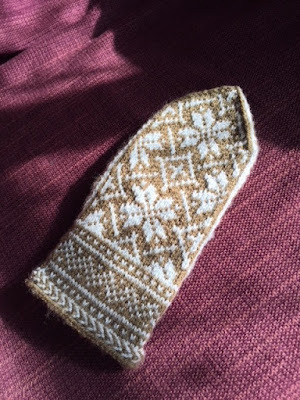 It really doesn't look the same but I've kept the same idea and stitch count. 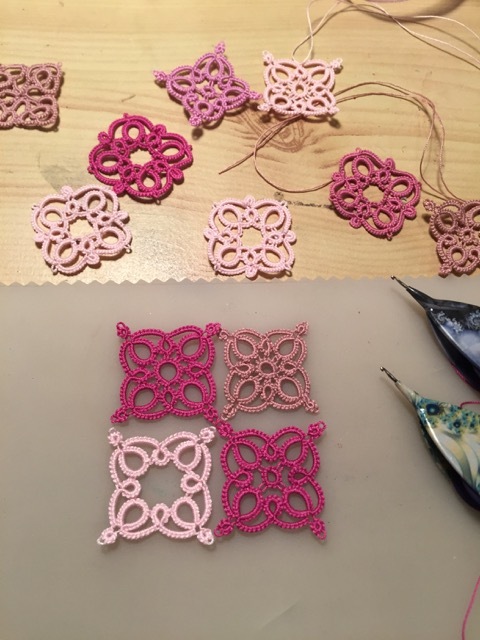 I tried different centres... which do you prefer? 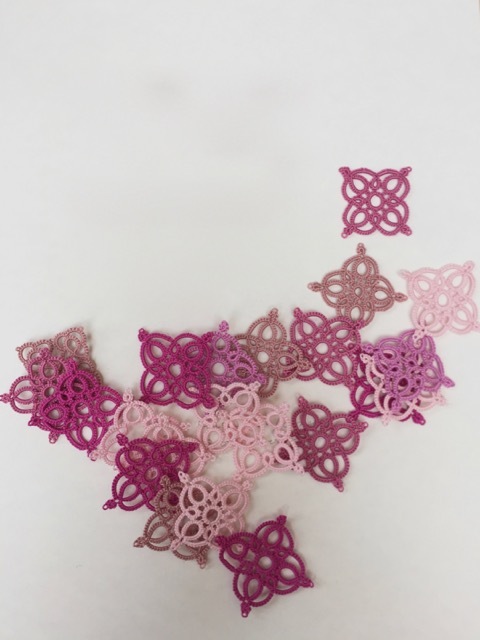 One has just four picots on a centre ring and only the big rings are joined to it (dark pink, bottom right); one has a larger ring in the middle and all rings are joined to it (dark pink, top left) and lastly, there is one without a centre ring (pale pink). The fourth one (top right) was an earlier version that didn't work out so well, it was too pulled in towards the middle which made it too small. The others do measure 3cm x 3cm and as you can see, they will now join easily at the corners. I suppose it doesn't really matter which I pick and I could make several of each version. When it's all put together, it's going to be hard to spot individual designs anyway. I like the idea of a worldwide tatting endeavour and wonder how the finished "fabric" will look! Thank you for your comments on the previous post. It's wonderful to read that many of you have been participating and sending off your little squares. So what do you think? Should I make all the same or send off different ones? Which one do you prefer? I think my favourite is probably top left (larger ring in centre, all other rings joined to it). 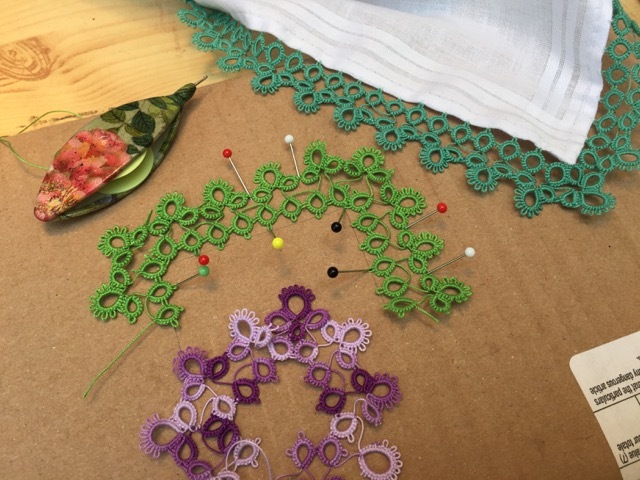 I have seen several tatters working on the little square for the Brussels Monument and as this is in support of women's rights around the world, it's a good cause which I wish to support. 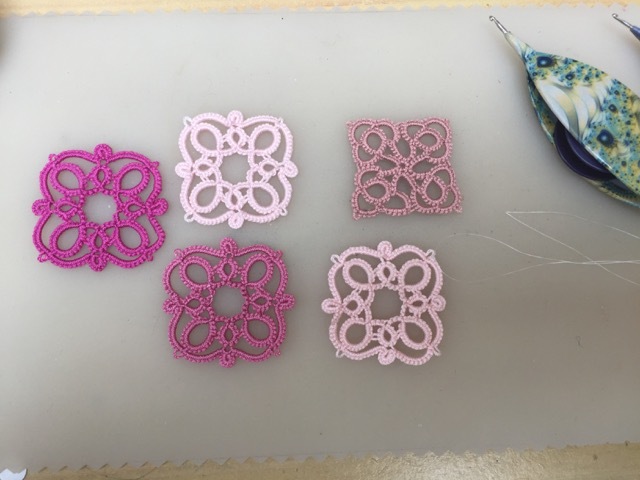 The project will also happen during the World Lace Congress in August so it's also good to help promote tatting. 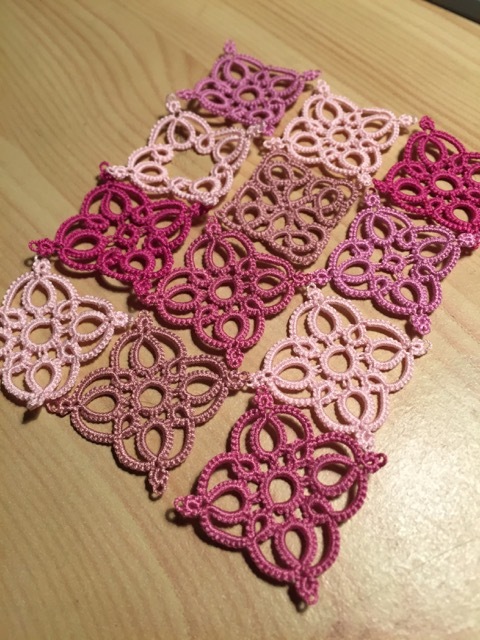 I'm a bit late joining the party but there are still two weeks left to send the squares so I plan on making several and sending them along. 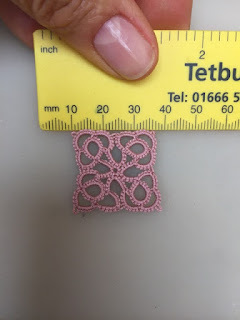 Cathy provides a pattern for the square but she also says you can use your own if you wish as long as it measures 3cm x 3cm. I wondered if my Quatrain would work and yes, if I omit the trefoils on the corner, it has the right dimensions. 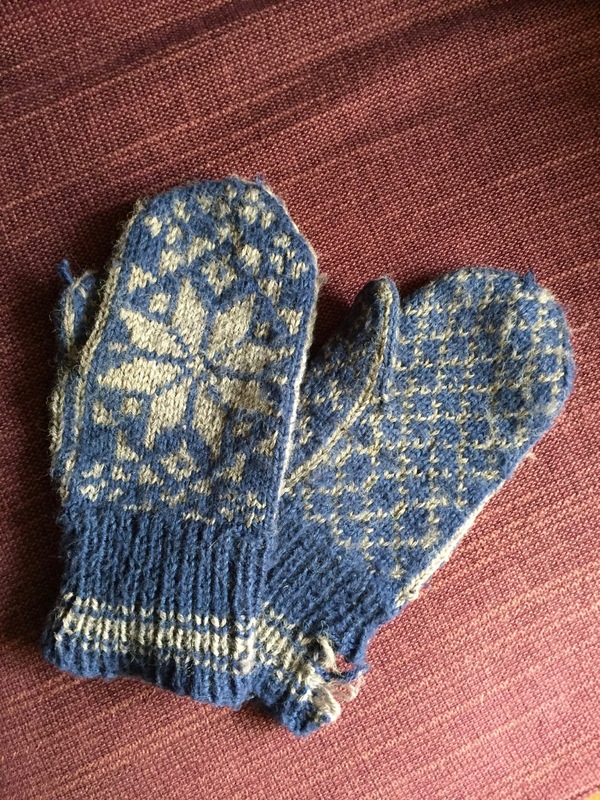 The one in the right hand corner is Cathy's pattern. 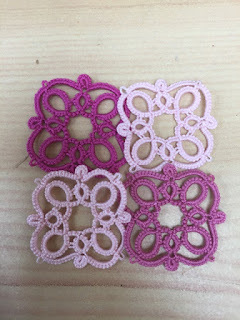 However, I have now realised, after tatting a few, that although the size is right, the shape is not! Because if you try to attach them at the corner, the curve means that they have to be one on top of the other to fit. 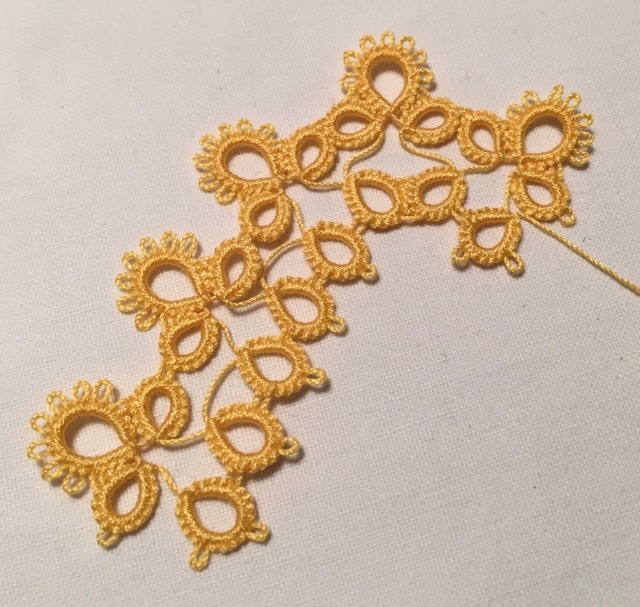 Of course I could just keep using Cathy's pattern but I'm stubborn. I want to make mine fit. So I will try to keep the spirit of it but change the shape so that it fits properly at the corners and at the size required. On the other hand, I'm wondering if I tat tightly though because I have measured my square made to Cathy's instructions and it turns out a bit too small! Right, off to play with my design and see what I can come up with. Anyone else making some of these squares? As some of you may know, the UK was recently hit by a rare snowstorm. This caused us to go in search of our warm mittens and hats so we could go outside and enjoy the snow. I found this old pair in a drawer which is now 35 years old! It's a little frayed but surprisingly not bad really for its age. It inspired me to look at patterns and think I could knit a couple of new pairs so we'd have them in the drawer for the next time we might need them... and because there are so many lovely patterns for these types of nordic mittens! This is the first of the new pair. The pattern is "Northman Mittens" by David Schulz. The colours are olive green and duck-egg blue. the Latvian braid which I'd not tried before. Easy to do and effective. It's the arrow-looking part at the bottom of the cuff. 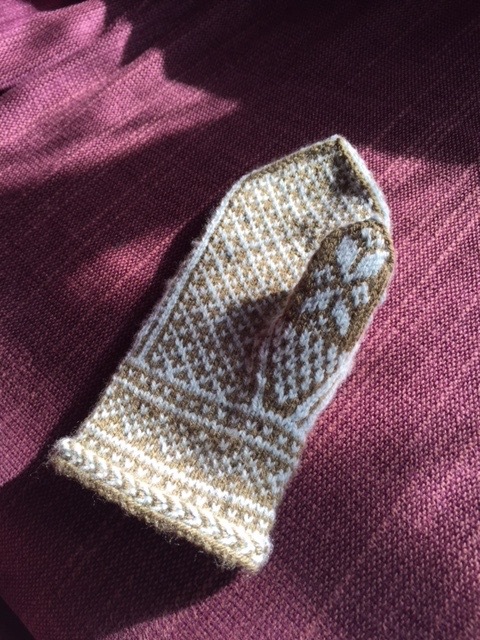 I'm on the second mitten now... but I've run out of wool! I thought it'd be a good idea to use leftovers... except there wasn't enough. I might try these "Selbu Mittens" next. 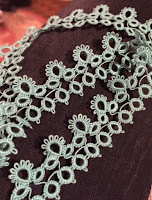 I made a video for the handkerchief edging. It needs quite a bit of editing before I can upload it but in the meantime, you can find the pattern here if you wish to make it. 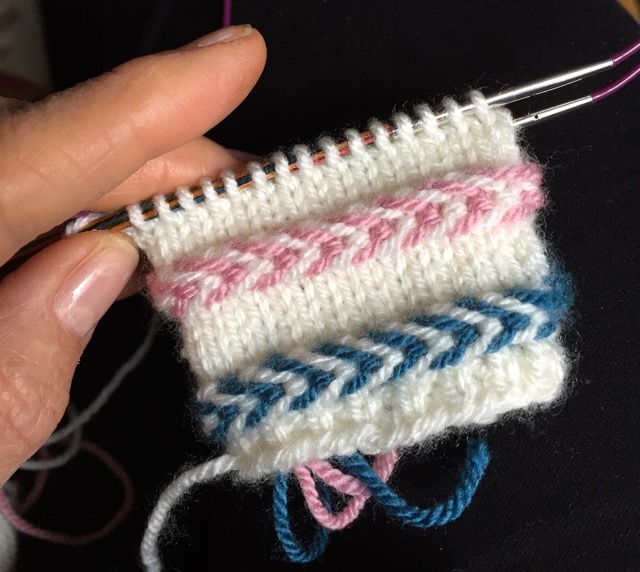 It's adapted from a vintage edging, in the "Hen & Chick" vein but slightly different. I modified the corner from the version in green I made on the hanky. It wasn't symmetrical and that bothered me so I played with it a bit and came up with a better corner. I pinned my versions on cardboard to make sure the angle was right and there was no pulling or frilling when going around the corner. I tried a few different versions before settling on probably the simplest, which is the one in yellow below. 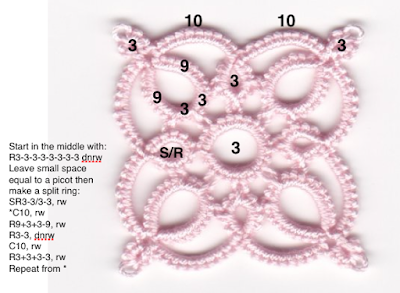 I hope you'll enjoy making this simple edging if you decide to make it. with no re-winding of shuttles required.